No Resort Fee. 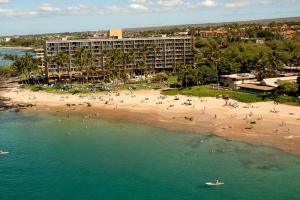 The Mana Kai Maui Resort is conveniently located in Kihei on one of the most scenic beaches in Maui. The condominiums include one-and two-bedroom suites, complete with fully-equipped kitchen and private lanai. An in-room safe is available. Take advantage of the resort atmosphere with special features including yoga classes, activity center and more. Oceanfront in Kihei, approximately 30 minutes from Kahului Airport. Maui Oceanarium, Golf, Volcano Trips, Helicopter Tours, Hana Adventures, Sailing Trips, Wailea's Finest Luau, Hike Maui, Snorkeling, Scuba.